The Manage Files tool is a file management system for your unit. You can use this tool to organise and upload files associated with your unit offering. We recommend that you organise your files into folders, creating a folder for each unit, module, or topic of content as appropriate. Manage Files enables you to select and upload files from your computer to Connect. You can upload most file types to a content directory in Manage Files, but only files with specific extensions can be used as content topics. Organise and manage unit files and folders - Perform tasks such as creating, editing, deleting, uploading, moving files and folder, and zipping and unzipping files. Create topics from your files - You can create topics using files from your unit content structure. Note: When you unzip a file on the Manage Files page in a unit, a message notifies you that the operation is happening in the background and that you will be notified when it is complete. This allows you to perform other tasks while waiting for the operation to complete. When the file successfully unzips, a notification appears in the minibar. Clicking the notification takes you back to the Manage Files page in the unit. You can create a content topic using a file directly from Manage Files. The Link icon displays beside files in use as topics in the Content tool. On the Manage Files page, select the check boxes beside the files you want to designate as topics. From the action bar, click the Add Content Topics icon. On the Add Multiple Topics page, from the drop-down list, choose a Parent Module for the topics. Enter Topic Titles. 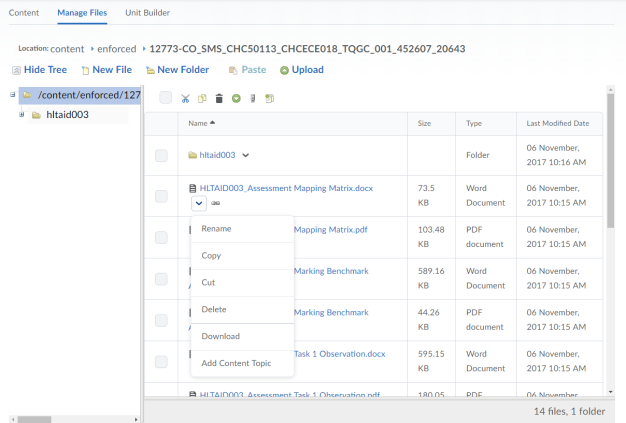 If you rename a file that is a topic in your unit, it automatically updates the file reference in the Manage Content area. Use caution when moving files and folders if they are referenced in the Content area. Moving a file that is currently in use as a topic might result in a broken link.